Bovril, the beefy drink beloved of football fans, has been stripped of its main meaty ingredient in a bid to boost sales, its maker has confirmed. Unilever says vegetarians can now enjoy the drink and the move will counter concerns overseas in the wake of BSE. The drink's usual 40% of beef stock has been replaced with a savoury yeast mix at the firm's Burton-on-Trent factory. Unilever said in blind taste tests 10% did not notice any difference and 50% preferred the new product. A spokesman for the firm said a long-term decline in sales had prompted the move. "It was not an easy decision to make because we know people like the taste of beef," he added. "Many people have a strong affection for the Bovril brand but that doesn't necessarily come through in sales. "In blind taste tests we have conducted 10% didn't notice any difference in taste, 40% preferred the original and 50% preferred the new product. "We have seen a long-term decline in sales, particularly in our export market, which used to account for 20% of sales, but has dropped to 7%. "One of the areas where we think we can grow sales is in this export market, particularly in Asia, where it is very popular. "In Malaysia they stir it into porridge and coffee but the government there was becoming quite restrictive on non-halal meat. "There were also a lot of limitations put in place because of BSE. "In addition we wanted to broaden the user base and it is now suitable for vegetarians as well." 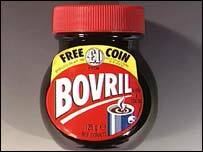 Bovril was invented by Scotsman John Lawson Johnston after he won a contract to supply one million cans of beef to the French army. The name Bovril derives from a name Mr Johnston found in a book. Vril was "an electric fluid" which according to the book "cured diseases and established equilibrium of natural powers". The Latin word for beef is bos. In 1884 Mr Johnston returned to London and set up a small factory in Trinity Square. Production switched to Staffordshire in 1968.